-BODYPUMP still feels awesome. I’m happy that it still feels good to strength train because I love it so much. It makes me feel strong, and since my hips are usually stable as I’m training, it doesn’t make my hip flexors hurt. TRX training and dumbbell work are still enjoyable right now, too. -Dance cardio. I stopped teaching Zumba a few weeks ago, and while I miss it, it was aggravating my hip flexors (and during Zumba I have a tendency to go a little crazy). I’ve still been doing Zumba at home to stay on my A game, and taking it super easy. I also tried Shaun T.’s new Cize workout (and posted a goofy video on Instagram), which was a lot of fun. -Yoga! Some poses still don’t feel as great as others, but it still feels great to move and stretch. -Barre. I’m hoping that I’ll be able to do barre until the very end, because it feels amazing and is probably my favorite workout right now. -Spinning! Thankfully, spinning still feels fantastic. I raised my handlebars up quite a bit to see if it would help with the belly, and it’s made a huge difference. -Very little treadmill walking. It’s funny that walking, aka one of the most pregnancy-friendly modes of exercise out there, feels terrible right now. I walked until I was 40 weeks pregnant last time, and this time, I’ve had to dramatically cut back. I’ve had quite a bit of hip flexor and round ligament pain, and walking faster than 3.0mph makes my hips ache and the right side of my stomach start to hurt. Sometimes it happens after 15 minutes, other times it happens within 3-5 minutes. If I take the dogs for a walk, or want to read on the treadmill, I’ll go super super slow. I’ve been enjoying spinning, dance, and modified at-home workouts for cardio. 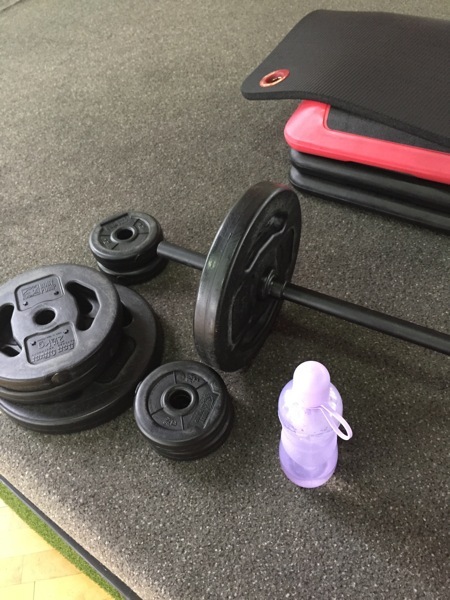 -Decreasing my BODYPUMP weights and slanting my bench so I’m not flat on my back. Except for my triceps, all of my BODYPUMP weights have decreased by about 1/3. -Decreasing the intensity of all of my classes. I’m not using a heart rate monitor, as your heart rate is elevated during pregnancy, but prefer to go by perceived exertion and the talk test. Since I get out of breath more easily, I need to work at a lower intensity to be able to talk while I’m working out (especially if I’m teaching and need to be talking a lot!). This is most prevalent in barre classes since I talk pretty much the entire time I’m teaching. If I do too much of the workout, I’m huffing and puffing into the mic. For spin, I’ve gotten off the bike quite a few times (especially during hard sprints to walk around the room and coach). 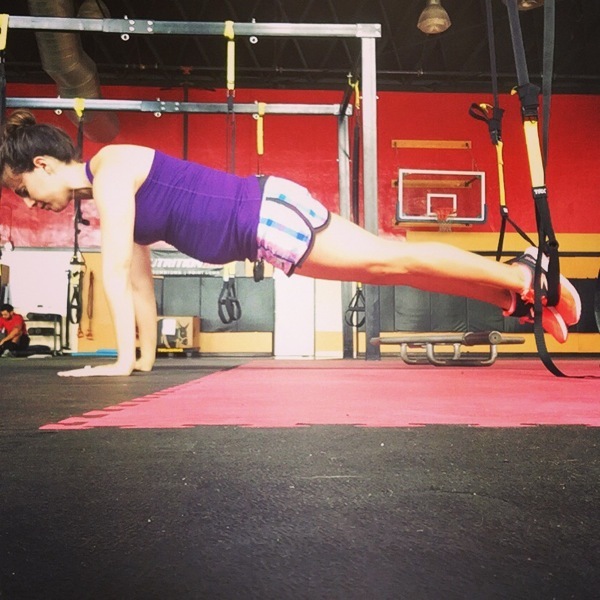 -Core exercise modifications. Other than plank and balance work, I’ll usually skip out on core training. I’m writing a whole post about core work during pregnancy, but you can usually catch me doing a plank, pelvic tilts, or spinal balances during the core components of classes. When I teach barre, I dramatically decrease the range of motion to demonstrate the exercises, or will do a few and then sit and coach for the rest of the core series. 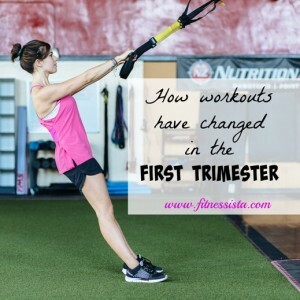 -I’m not sure if it’s because I’ve gained more weight this pregnancy, but my workout clothes do NOT fit me the same way. Last time, I was able to wear a lot of my lulu pants and crops the entire way through, and this time, the pants and tanks are still ok for the most part, but the shorts are borderline inappropriate haha. It’s a bummer because it’s been really hot lately and wearing pants sounds like a nightmare. I’m probably going to get a few inexpensive pairs from Target to last me through the rest of summer. -Enjoying more yoga and mind-body exercises in the third trimester. I’m joining a PIYO challenge group with some friends this Monday, and am excited to try another low-impact yet effective workout. Also, I think Chalene is fitness magic and enjoy learning from her any chance I get. -Sweating from my eyeballs again. While I’m thankful that I’ve been able to remain active this entire time, I do miss pushing myself to my max. Of course, I’ll do anything to have a healthy baby and avoid working too hard. As soon as I’m up to it again after the delivery and sleep deprivation, I’m going to CRUSH IT at Orangetheory, and weep sweat of happiness. I’m also so excited to go back to hot yoga after little miss’ arrival. I didn’t see the last post about the low-lying placenta, but I had placenta previa that they were only about 25% hopeful that it would move. It totally did and I delivered without a c-section just fine! I hope it moves for you! Lots of love for your little ones! I’ll be keeping you in my prayers for your ultrasound tomorrow! I hope everything is alright, Gina! 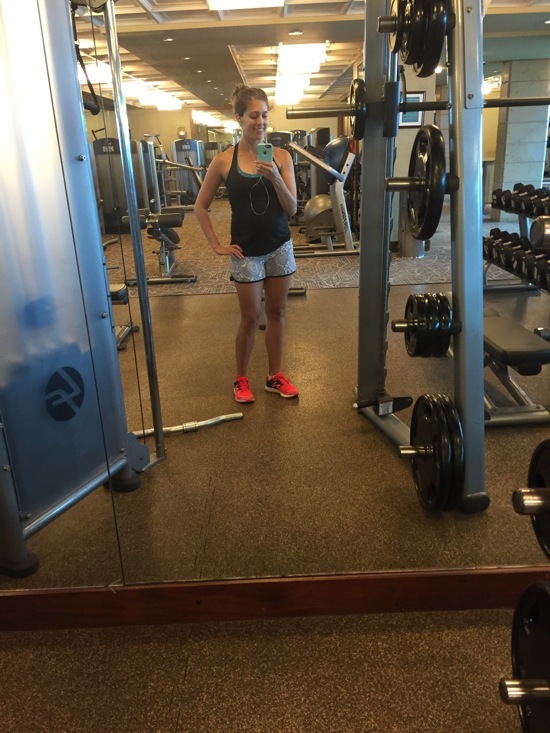 I got a few pairs of workout capris from Old Navy while k was pregnant and loved them! 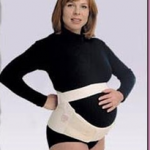 They have a yoga waistband which is very pregnancy (well, any time, really!) friendly. I’m happy to see another momma work so hard to stay active while growing a wee one. Good luck tomorrow during your ultrasound! Thank goodness I’m not the only preggo out there who can’t walk much! I’m loving spinning, strength training and yoga though! I haven’t been able to walk much either — at 30 weeks it started causing a lot of round ligament pain and Braxton Hicks contractions, and I had to stop walking long distances. At 35 weeks now, I’m mainly doing Barre, Pilates, and for some cardio, short walks and the elliptical. I never thought I’d have to stop walking so soon, but oh well! Hi GIna! I have been reading forever and have never commented! I remember when you were pregnant with your first daughter! I cannot speak highly enough of Old Navy Maternity workout clothes. I just got two pairs of shorts and I love them. They go under the belly. And their tanks are awesome. I think I paid $15 for the shorts but they are on sale for $9 now! I’m so inspired by you!! I miss hard workouts so much! I keep daydreaming about my old long runs and hot yoga. Of course healthy baby is the most important thing! I have been wanting to buy piyo buy have not heard much about it. At 32 weeks, I am doing a little yoga and lots of walking. I can’t imagine doing anything more intense, but I’m very consistent with my yoga and walking!